Two combat veterans, a contentious state schools superintendent race, and Oklahoma's first African-American female Senate candidate face Oklahoma voters this week. Early voting began Thursday and continued into the weekend, and the winners in Tuesday's runoff advance to November's election to square off against nominees who found out their fate just over two months ago after the June 24 primary. KGOU News Director Ben Fenwick gathered University of Oklahoma political scientist Keith Gaddie, Oklahoma Watch political reporter M. Scott Carter, and eCapitol News Director Shawn Ashley to discuss some of the implications of what's left on the ballot. Oklahoma Corporation Commissioner Patrice Douglas and former state Sen. Steve Russell advanced to the August 26 runoff despite combining to win just over 50 percent of the vote, with roughly 1,000 votes separating them. Russell is a retired Army lieutenant colonel who served in Iraq and helped capture Saddam Hussein in 2003, and Carter says Oklahoma's historical embrace of military candidates works in Russell's favor. Ashley says Russell's military background also extends to how aggressive-yet-disciplined his campaign has been, despite Douglas' 2-1 fundraising edge. "The day after the primary election, I received an email, a campaign email, from him. And that drumbeat has continued from the primary election up to today," Ashley says. "Those emails cost them very little. Even while he may not have been on TV or radio during that time, and it seems like it was a very well-planned, very well-thought out approach. I did not hear from Patrice Douglas' campaign in the same way for a number of weeks." Gaddie says Russell's effective 2014 campaign came from learned lessons during his first state Senate race, when despite help from top consulting firms and a deep war chest, he still almost lost in a runoff. Media buys also matter in this GOP contest in ways that might not affect Democratic electors. "Because these are Republican voters, it's actually an audience you can get to with radio," Gaddie says. "AM radio, news radio, Christian radio - it's cheap. It's cheap to run an effective campaign." Democratic voters will decide whether longtime educators John Cox or Freda Deskin advance to November's general election to face Republican nominee Joy Hofmeister, but Gaddie says he doesn't think it matters who wins the Democratic runoff. "Joy Hofmeister slayed the dragon, for lack of a better way to put it," Gaddie says. "She beat an exceedingly unpopular incumbent Republican. She didn't go to a runoff. We didn't have two more months of negative campaigning which would've damaged whoever the eventual nominee would've been." Despite outgoing State Superintendent of Public Instruction Janet Barresi's unpopularity, Carter says he hasn't seen teachers embrace Hofmeister. "What I hear is 'Anything but the status quo'," Carter says. "And they see the status quo as Republican." And to combat that status quo, many teachers changed their party affiliation in order to vote against Barresi, which could affect Democratic turnout in the Cox-Deskin contest. An analysis by the Enid News & Eagle found that 1,253 schoolteachers and educators became Republicans over the past year. They mostly come from small, rural school districts. More than half of them work in districts with fewer than 200 state certified educators. These schools are spread throughout the state and don’t seem to fit a geographical pattern. Sentinel, Central and Frederick Public Schools had roughly a third of their teacher corps change parties. Stringtown, a district of 19 certified educators near McAlester in the state’s southeast quadrant, saw more than half convert before the June 24 primary. Overall, both Republicans and independents gained more than 12,000 new voters in the year before May 2014, while Democrats lost 7,523. According to the analysis, neither major party holds a significant registration advantage among teachers. "And you know they took a spouse, or a sibling, or a child, or a friend with them when they did that," Gaddie says. "That was a lot more than 1,200 votes, but I think the fever has broken within that race." State Sen. Constance Johnson and perennial candidate Jim Rogers are both vying for the Democratic nomination to face U.S. Rep. James Lankford to fill the U.S. Senate seat vacated by the retiring Tom Coburn. Gaddie says it's a tough fight, since the Democratic nominee will have to overcome Lankford's several million dollar fundraising machine, evangelical and movement conservatives, and swing voters in Oklahoma City who like Lankford because he's their Congressman. "That's an awful lot to plow your way through when you're going to be underfinanced," Gaddie says. "If Connie Johnson wins, she will be the first black woman nominated for a major statewide office, and the first Oklahoma woman nominated for the U.S. Senate." Even though Rogers' campaign consists of little more than red sweatshirts and roadside signs, Ashley says it's realistic the man who's run unsuccessfully for nearly every statewide position could beat Johnson in Tuesday's election. "It comes down to who shows up," Ashley says. "There are people in Southeast Oklahoma who may not know who Connie Johnson is, but they have seen Jim Rogers' name on the ballot time and time again. They may think he's an incumbent, that he's working his way up, and they're going to vote for the guy." Early voting begins Thursday in runoffs that feature two statewide races for Democratic voters and runoffs for both parties in the 5th District U.S. House contest. Democrats will choose nominees in a U.S. Senate race and for Superintendent of Public Instruction. 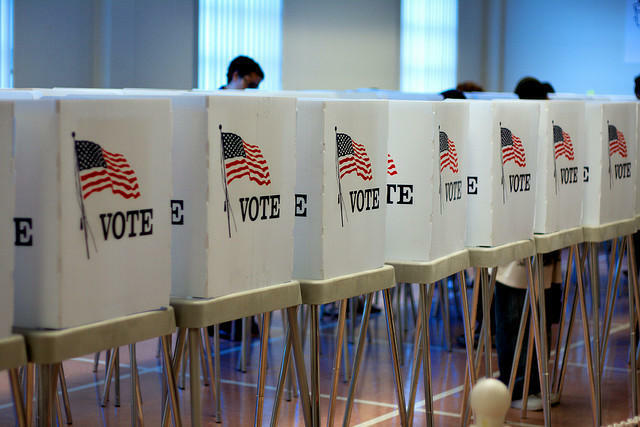 Several state House and Senate contests are also on the ballot. eCapitol's Shawn Ashley told KGOU's Ben Fenwick it's the first time Oklahoma has had statewide races in a runoff in August, and that could affect voter turnout. Candidates in Oklahoma's fifth congressional run-off races work to get their messages out and their voters to the polls. The contests pit former state senator Steve Russell against former Edmond mayor Patrice Douglas for the Republican nomination. State senator Al McAffrey and retired college professor Tom Guild square off for the Democratic nod. The latest campaign finance reports show Gov. 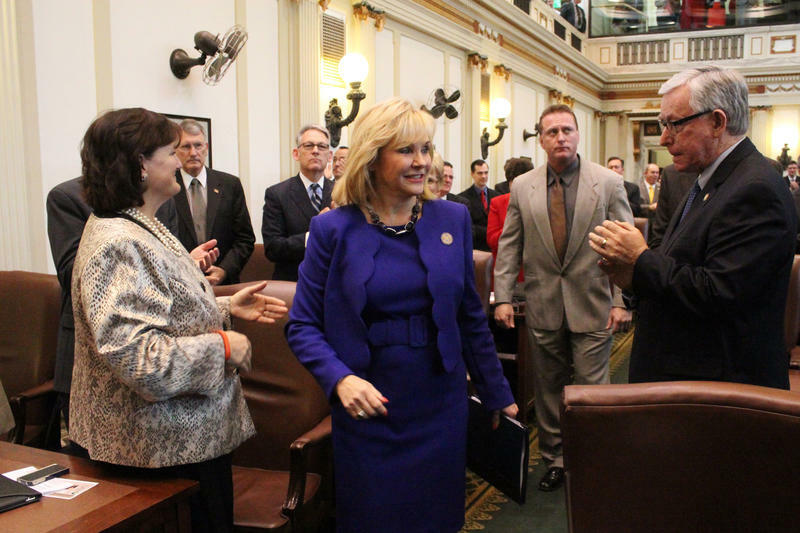 Mary Fallin has topped more than $3 million in contributions to her re-election campaign and is continuing to distance herself from her opponents in fundraising. Campaign contribution and expenditure reports due by midnight Tuesday show Fallin raised a little more than $3 million for the reporting period that ended June 9, with more than $1.5 million remaining in cash on hand. Fallin faces two little-funded GOP challengers in next Tuesday's primary election -- Dax Ewbank and Chad Moody. Oklahoma Governor Mary Fallin's decision to set aside Common Core education standards further heats up an already-hot race for state schools superintendent. Fallin signed a bill Thursday repealing standards set to take effect in August. Oklahoma returns to guidelines in place before 2010, but will set new ones. Both Fallin and incumbent state superintendent Janet Barresi initially supported Common Core but changed their positions. Even before the bill was passed, Barresi drew two GOP challengers this year. Conservatives have said they fear Common Core allows too much federal influence over state schools.